The Channel Islands of California are in my back yard, but miles away and difficult to reach. They act as a barrier between the coast and the wide open seas of the Pacific Ocean. As well, it is part of the migration route of many sea mammals, such as whales, as they travel from Alaska to the Sea of Cortez. There is a rich history here, too, of Native Americans (the Chumash in our area) and the Spanish explorers. I’ve sailed here, been out on whale watching expeditions, and visited Anacapa. 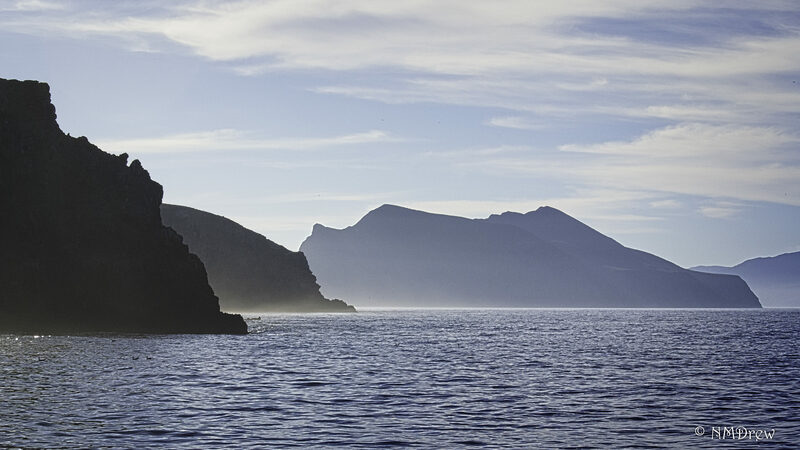 Now, this area is protected as the Channel Islands National Marine Sanctuary and the Channel Islands National Park. I think I need to visit these islands more frequently! This is a picture taken from the eastern side of Anacapa, looking northwest. The first few humps are Anacapa Island, and the rest are Santa Cruz. oh my goodness that’s just stunning!! Thanks, Fraggy. I had been looking to the left, at Arch Rock, and then looked to the right . . .